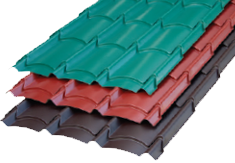 The tile roof profile is the latest addition to the Company roofing range which is neat and aesthetic giving a streamlined and attractive perspective to any building. 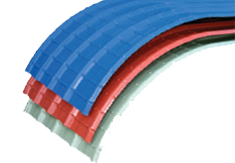 The tile profile is ideal for gable roofs of dwelling houses, hotels and any commercial building requiring an elegant finish. 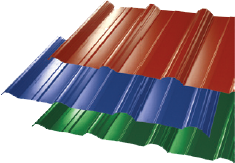 This profile with dome shaped ridges double fluted on sides of ridge and a single flute on valley enhances the strength of the roofing and is also applicable for purpose of cladding. Our range of curved sheets consist of four curvings. 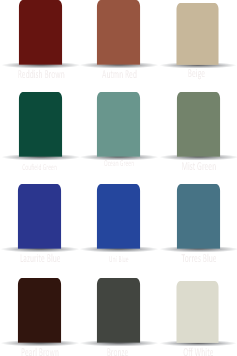 These sheets are recommended for walk ways, weather sheds, car park, bus stop and a variety of commercial, industrial and domestic applications. The curve sheets also contribute to cost saving due to lesser supporting frame work for fascias, roofs.